An ultrafast optical nanoswitch that can be triggered chemically or biologically has been introduced by researchers in the US. The switch consists of one semiconductor quantum dot placed in the vicinity of a metallic nanoparticle. Its main task is to convert ultra-small variations in the refractive index of the environment, caused by chemical or biological agents, or minuscule changes in the distance between the quantum dot and metallic nanoparticle, into dramatic optical events on nanosecond timescales. The switching process is based on the development of a new state of nanomaterials combining the physical properties of metallic nanoparticles (surface plasmon) and semiconductor quantum dots. Currently, significant research activities are conducted to develop nanoswitches that can be triggered by a variation in environmental conditions. Some of these switches include combinations of biomolecules with semiconductor nanocrystals or metallic nanoparticles or both. We recently investigated an optical nanoswitch based on completely new physical concepts. The switch is based on a nanosystem formed by pairing a single semiconductor quantum dot with a metallic nanoparticle at a given distance. We discovered that such a nanosystem can act as a sort of “molecule” (meta-molecule) when it is illuminated by a laser field. This “molecule” has its own characteristic states (meta-states) and resonances (plasmonic meta-resonances). Therefore, our nanoswitch is in fact a nanoparticle meta-molecule and the switching process happens when this molecule is transferred from one of its meta-states (B) to another (D). 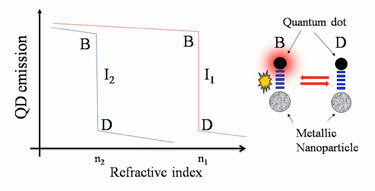 A key feature of this switch is that the transition between B and D states can be triggered by minuscule changes in the refractive index of the environment. In the state B the quantum dot is very illuminating while in the state D it becomes nearly completely dark (see schematic). These nanoswitches can be tuned by varying the intensity of the laser beam responsible for generating the meta-molecules, and offer a very large dynamic range. Such a switch and the physics behind it offer new opportunities for the design and development of active nanosystems that can reversibly respond in real time to length variations on a nanometer scale, temperature changes, conformational changes, or the presence of a biomolecule by sending out distinct characteristic optical signals. Potential applications include the precise detection of variations in the concentration of different substances in the environment or their minuscule introduction into the environment. More details can be found in the journal Nanotechnology. Seyed Sadeghi is assistant professor in the physics department at the University of Alabama in Huntsville, US. His research interests include the investigation of collective, dynamical and optical properties of hybrid nanosystems and their device applications.